Hosted at the New School, the World Policy Institute (WPI) is a research and education policy center that seeks innovative solutions to critical problems of international diplomacy and world politics. WPI conducts an extensive program of lectures and policy forums to broaden understanding of the complex post-cold war geopolitical and geoeconomic landscape. Its website offers a good quantity of infos about the center’s activities and upcoming events. In particular, free access to the center’s projects and publication descriptions is allowed, often with links to their specific websites. 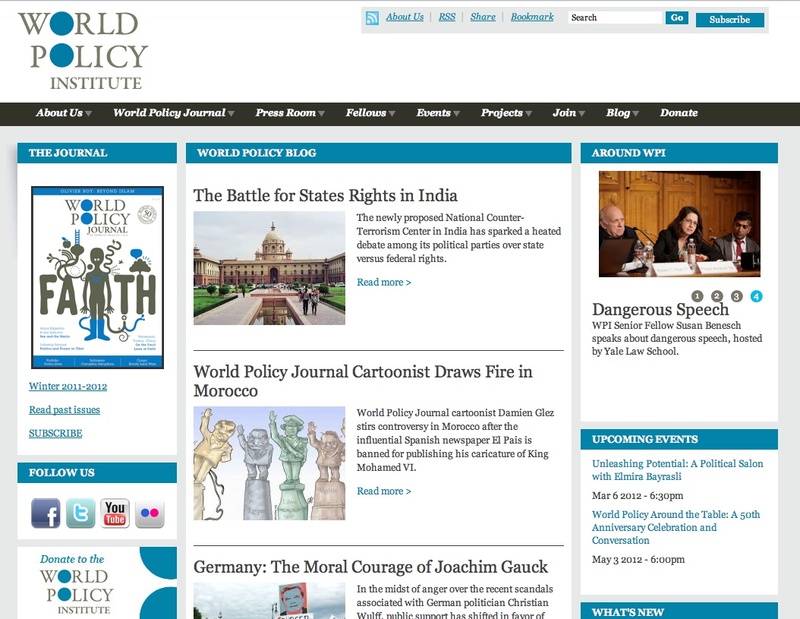 It also provides full-text articles or abstracts from recent issues of the World Policy Journal, a quarterly journal devoted to international affairs; as well as a bi-annual newsletter on research projects and events, and a media guide reporting the WPI staff media activities and exposure. An open discussion forum on world politics’hot topics is also available. Material contained in this website is abstracted, searchable by keyword or browsable through clear directories, and freely downloadable mainly in pdf or web format. Despite the absence of advanced help tools and a dense homepage, the website presents a clear content categorization, so that navigation may result easy also for non-experts.